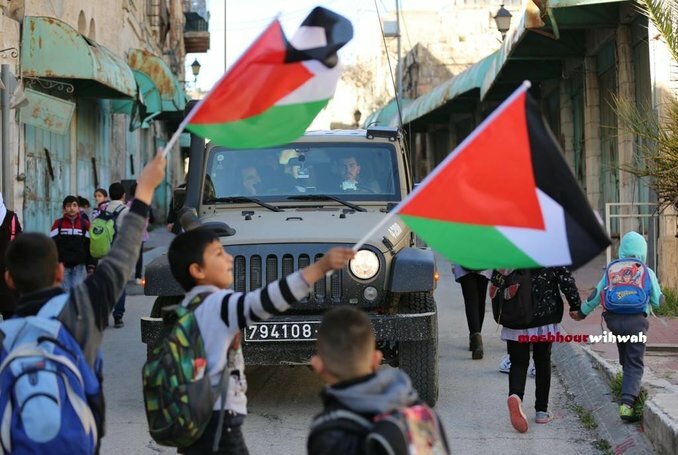 Yesterday Palestinian kindergarteners protested Israel’s jailing of 350 Palestinian children, in a march organized by the Hebron (Al-Khalil)-based group Human Rights Defenders and the Palestinian residents of Shuhada Street. Israel detains children as young as 12 years old. The kindergarteners rallied for three child prisoners in particular, a young girl named Razan Abu Sal, 13, who was sentenced to 13 and a half months and a fine of $870, Shadi Farrah, 12, who has already served two years of his three year sentence, and the infamous Ahed Tamimi, 17, who was detained (at age 16) on charges of incitement and slapping an Israeli soldier. She has become a worldwide symbol of child imprisonment and the Palestinian struggle for freedom. Activists with Human Rights Defenders, Badee Dwaik and Arif Jabar, organized the rally in one of the most contentious areas of Hebron, the Tel Rumeida neighborhood where Palestinians systematically experience violence from settlers, and the Israeli soldiers in the area tend to turn a blind eye, or back up those settlers. Badee Dwaik told the group that the demonstration marked the start of the annual campaign, “Dismantle the Ghetto,” an effort to publicize and protest the horrors of life under the illegal occupation in the city of Hebron. The campaign is a call for the lift the closures inside of the city and the suppression of its population. 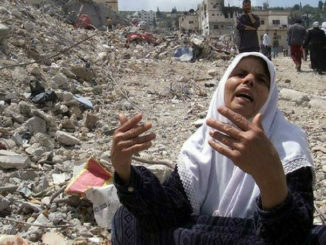 It will be held on the 24th anniversary of the massacre at the Ibrahimi mosque by Baruch Goldstein. On February 25, 1994, Goldstein opened fire on Palestinians worshippers inside of the mosque, killing 29. At the demonstration the children carried signs protesting the occupation, an all encompassing-word for the abuses and indignities that are carried out against them by Israeli soldiers and settlers. They chanted, “every child deserves a childhood.” They asked the international community to protect them and for international law to be upheld. 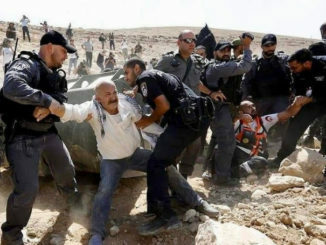 The demonstration culminated with settler attacks on two Palestinian journalists, Du’aa Yahya al-Atrash from Ma’an television and Zidan al-Sharbat. 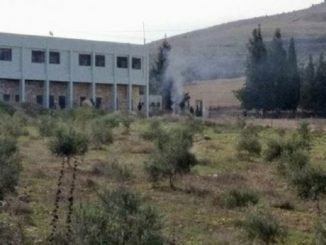 When the event ended, Israeli soldiers prevented the children from returning to their homes.